Home Hookless and EZY Hang Shower Curtains and Curved Shower Rods -VERY POPULAR. RuJan HORIZON - Decorative Top Sheet, Size: QUEEN 96' X 98' (96" Wide x 98" Long)-Color- Tony Taupe, price each. 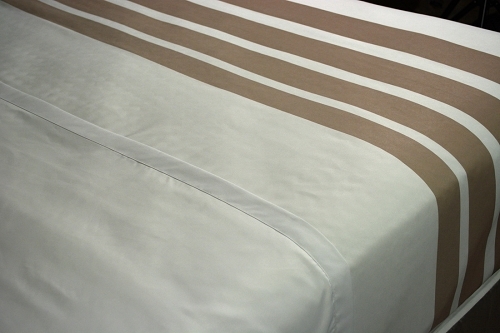 This Luxury Horizon Decorative Top Sheet is made of 100% Microfiber Polyester / Soft Peach Finish. The fabric is a Stain Release Finish / Easy Wash Care, Will Not Fade. These sheets are so soft and elegant and quite unique. Available in your choice of Caviar Stripe, Honey Mustard, Pompeian Red and Tony Taupe. 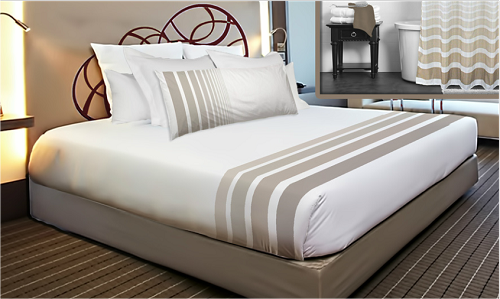 These sheets are machine washable for easy care and repeated use. These luxurious sheets look and feel so soft. Really a five-star hotel room setting. Exceptionally comfortable, they are generously sized to fit deep mattresses. The set is perfect for any bedroom in your home, condominium or boutique style Resort/hotel and also makes an ideal wedding gift. Note: These sheets are matching to your shower curtains, and bed coverlets and blankets as well as body pillows. Truly a unique bedding ensemble.. ……Dare to be different!……..
· Color options: Caviar Stripe, Honey Mustard, Pompeian Red and Tony Taupe.